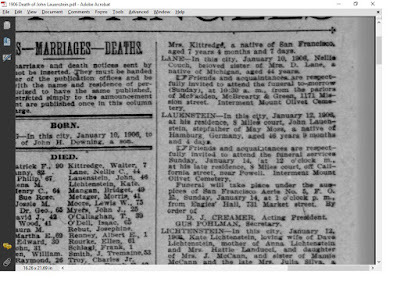 The latest discovery in my own family history is an obituary which ties my great grandmother, Mae Blanche Moss to a man named John Lauenstein in 1906. The obituary states that "May" Moss is the step-daughter of Mr. Lauenstein. My maternal great grandmother, Mae Moss, was the first wife of my maternal great grandfather, Ernest Coffman, and the mother of Elaine and Vivian Coffman. Later she married Ernest "Doc" Forbes, a pharmacist for Owl Drug. Mae Moss is my genealogical mystery woman. She was placed in the Sacramento Protestant Orphan Asylum by her mother in 1892. This institution was known to us in Sacramento as the Sacramento Children's Home. !BIRTH: 1882 Sacramento Children's Home Register; copied by Jill Mayne, Oct 1989 May Moss born Feb 19 1882, American; came to California June 1890, Sacramento; Admitted: 6 Dec 1892 by Mrs. J. Moss; Discharged: 4 Aug 1897 to Mrs. Moss, Father: Nashville, Tenn.; Mother: Richmond, VA; Married: Galveston, Tex. ; Parents Death: Waco, Texas; Parents Habits: Intemperate. Mrs. Moss took May without permission from the Board. I have never been able to find any records which substantiate any of the vital information provided by Mae's mother to the orphanage. Between the 1906 San Francisco earthquake and the 1900 Galveston storm, there has been considerable record loss which has affected my search. Mae stated on her 1936 application for a Social Security account number: Mae B. Moss Coffman; 885 Aileen Street, Oakland Calif.; Employer: Owl Drug Co. at 14 & Washington Sts., Oakland, Cal. ; age at last birthday: 51; DOB: 19 Feb 1885; POB: Brooklyn, New York; Father: John Moss; Mother: Annie Lanstein; signed Nov. 30, 1936 by Mae B. Coffman. The San Francisco Call, Saturday, January 13, 1906, page 13. LAUENSTEIN---In this city, January 12, 1906, at his residence, 8 Miles court, John Lauenstein, stepfather of May Moss, a native of Hamburg, Germany, aged 46 years, 9 months and 4 days. Friends and acquaintances are respectfully invited to attend the funeral services Sunday, January 14, at 12 o'clock m., at his late residence, 8 Miles court, off California street near Powell. Interment Mount Olivet Cemetery. D. J. CREAMER, Acting President. Mae and her mother lived in San Francisco on the street below the Fairmont Hotel. Going up California Street it was the first street before you hit the top. The rooming house was down there in the middle of the block. Mae worked on California and Montgomery at a fancy fruit and vegetable market for Mr. Gedding and she apparently knew the family. She was a cashier. When the fire broke out after the earthquake in 1906 some of the people went to the Golden Gate Park. Elaine remembers her mom telling about her father pulling this trunk down California Street one block below the Fairmont all the way down to the ferry boat which went over to Oakland. They assume that Ernest took Mae and her mother to Aunt Viola Coffman Hughes house at 742 46th Street. !BIOGRAPHY: 1906 Vivian McGrath, Interview by N. Cimino 10 Nov 1989; Vivian told me many times that her mother and grandmother were in San Francisco during the 1906 earthquake. Mae Moss was working as a cashier or a bookkeeper for Mr. Gedding who had a wholesale produce company at the foot of California Street. Mae and her mother were living in a flat on a little narrow street right behind the Fairmont Hotel. They put their possessions in a big trunk, got the trunk down the stairs of the place and pushed it out to California Street but they could not get the trunk up the hill because it was too steep. Mae smiled at two strong men coming up the hill and they pulled the trunk up the hill for her. She and her mother then pushed it down the hill. They got out to Golden Gate Park somehow. Everyone was camping in the park. Ernest Coffman found them in the park and brought Mae and her mother back to Oakland to the house of Viola Coffman Hughes at 742 46th St.
To corroborate the above stories, I checked the 1920 Census for names that sound like "Gedding". I found a Mr. Charles L. Goetting, age 52, born in Germany, immigrated 1868 and naturalized 1878. He was a lodger at 568 California Street and his occupation was produce salesman. He is also listed with his family at 675 Second Avenue. The story about Mr. Goetting checks out pretty well. I have found advertisements for his produce business. Now I have John Lauenstein as the stepfather of Great Grandma Mae and residing near California Street. His gravestone in Mt. Olivet in Colma says that his wife was Virginia. That threw me a curve ball. I cannot find him or a wife named Virginia in the 1900 census of San Francisco. What happened to Mae's mother, Annie? Is Virginia the same as Annie? Why doesn't the obituary mention Virginia? Grandma Mae has been one step forward and two steps back at every turn in the research journey. But at least I have a few more names to trace down and hopefully, it will lead to actual records of Mae and her parents. Per obituary; died January 12, 1906, aged 46 years, 9 months and 4 days. This yields a birthdate of 8 Apr 1859. 1900 CENSUS • Presumably San Francisco but have not yet found the census record for John Lauenstein despite a variety of clever search techniques. If I could find this record it might reveal the mysterious Mrs. Virginia Lauenstein. Before 1906 he was married to a woman named Virginia [maiden name unknown] per the gravestone. Unfortunately, there do not appear to be marriage records for San Francisco County available prior to the 1906 earthquake. The Western States Marriage Index at Ancestry.com shows a divorce occurring in Boise, Idaho between a John Lowenstein and wife, Annie. 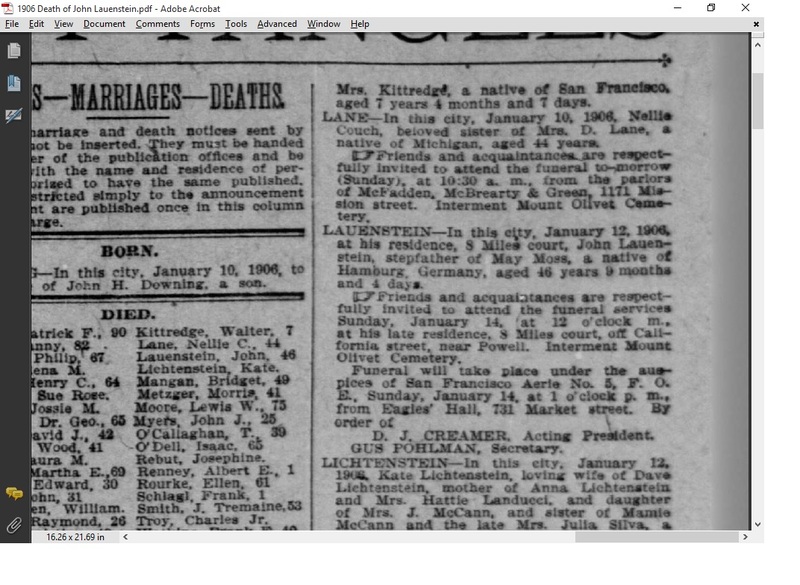 The index refers to a marriage occurring in San Francisco on 10 Jun 1890. The date of the divorce is not given. It seems odd that Annie or John would have gone all the way to Boise to get a divorce. The original divorce record in Ada County, Idaho may reveal more but the transcript in the Western States Marriage Index has several blanks in the form. See transcript above in italics. !BURIAL: January 14, 1906 per obituary. 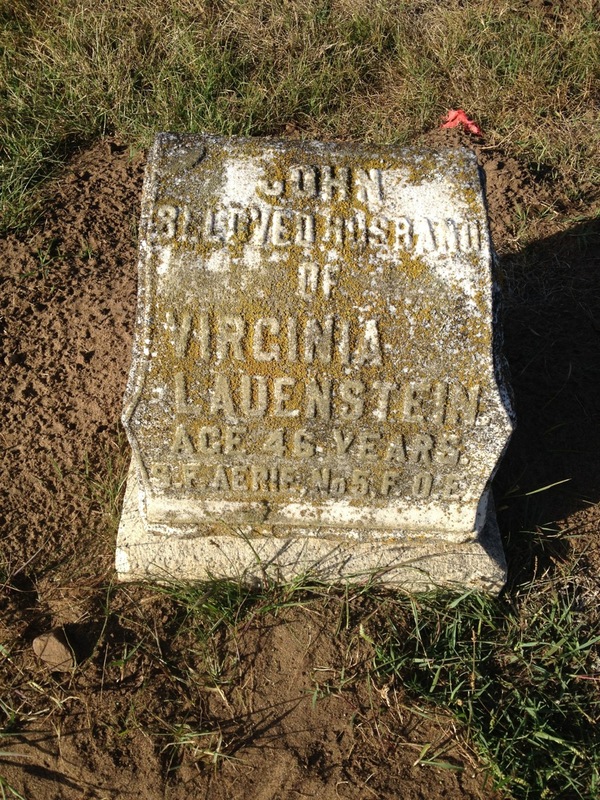 Marker Transcription: JOHN, BELOVED HUSBAND OF VIRGINIA LAUENSTEIN, AGE 46 YEARS, S.F. AERIE, No. 5 F.O.E. !PROBATE: A reasonably exhaustive search has not revealed a probate record for John Lauenstein.